I've had the pleasure of hiking into Silver King Creek at Llewelyn Falls on two occasions. The first was a solo trip that I wrote about here. The second occasion was a trip with Bernie Weston and DFG's Dave Lentz. On those trips I caught three native Paiute Trout that had come down over the falls from the pure population above. I went back a second time because the three of us thought it would be the last chance to catch a Paiute in its native range for some time. The day after our trip Silver King was to be closed for rotenone treatment to remove the non-native rainbows to make way for the native fish. Unfortunatley, on the evening of the day before the restoration was to start, after the DFG had mobilized at the trailhead and organized supplies and volunteers, a last minute lawsuit and court order sidetracked the restoration efforts. As part of the restoration plan and ongoing management effort, the regulations were changed effective the day the treatment was to take place. The fishing closure point on the creek was moved from the falls a ways downstream to Tamarack Creek. This new closure point has remained in effect since that day in August 2005 and has effectively wiped out any possibility of catching a Paiute in their native range. I do know of one person that went into Silver King below the new closure point and caught a Piaute at the conflunce of a tributary creek that holds Paiutes in its headwaters. To me this was remarkable. I've also spoken with a few folks that have caught Paiutes in legal waters outside of their native range. To do this requires some tough off-trail hiking, good navigation skills, and a lot of determination. This is a Paiute that was caught just below the falls. Four years later Dave the DFG is continuing in their efforts to restore the Paiute. They are obviously committed to doing everything they can to protect diversity and are in it for the long haul. My hat goes off to them and I stand committed to do whatever I can to help support the goal of restoring native species to their native ranges. Silver King is a beautiful creek in a spectacular high alpine setting and its beauty will only be enhanced if this rare trout is able to once again fin in the waters that drove its diversification. I would like to request that Sac-Sierra TU write a letter of support for the Paiute cutthroat restoration project on Silver King Creek. This would entail endorsing the alternative number 2, eradicating non-native trout below Llewellyn Falls using rotenone, from the draft EIS/EIR that is in comment period now. 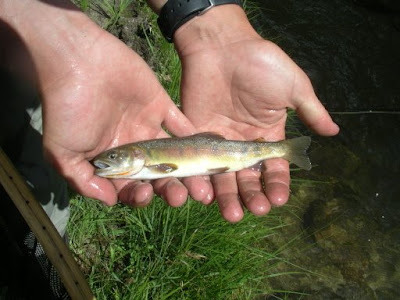 Letters from individuals (in addition to a chapter letter) that support restoring the Paiute cutthroat would be greatly appreciated--this may turn out to be "numbers game", supporters v. opponents, in certain of the approval arenas that the project must pass. There are several permitting steps that are vulnerable to opposition. Supporters should favor Alternative 2 in the EIS/EIR and support returning the Paiute to its native home. So, this would be asking a favor of you individually, as well to write. let me know if you need more info. Have a great board meeting and keep up the good work!! A couple weeks back I spent the weekend up around Redding and fished the Upper Sac one day and then did an overnight float trip on the Lower Sac the next two. The reports said the Upper Sac was fishing tough with high water and that the Lower Sac was on fire. The reports were pretty accurate. I fished the Upper around Delta at a few spots I like and have caught big fish at in the past. The lower part of the Upper Sac is a great stretch of the river with bigger water and bigger fish. It seems that there are a few larger and wild fish down low that can be difficult to catch and a lot more "cookie cutters" up top. At least that has been my experience. I managed to dredge this nice fish up not too far from Delta. Before starting the drift on the Lower Sac we fished near the Sundial Bridge. This picture is a must have for norcal anglers. We drifted from Bonnyview down to Jelly's Ferry and camped about half way in between. The boat was a two-man pontoon that was pretty easy to fish from. About half the fish caught came from drifting and half from wading. I'll take wade-caught fish over fish from a boat any day. There are truckloads of fish in the Lower Sac and if you drift enough water with a good drift you will catch them. On the other hand, when you are wading you can find a spot where there are likely fish and then use knowledge and experience to figure out what is going on. We had one such experience on this trip where it took about an hour to figure it out, but then once we did we yarded 'em. Below are some representative Lower Sac rainbows.